Especially if it's a drug. In the immortal words of South Park's school counselor Mr. Mackey, "Drugs are bad." So it's no surprise that many of us think of our morning cup of java as a guilty pleasure. It contains a drug: caffeine. The thing is, there's not much to be guilty about, unless you held up a barista to get that latte. Multiple studies have shown that caffeine — in moderation, of course — is good for you in a whole host of ways. However, not all studies have been able to positively link coffee's benefits to the caffeine. There are lots of other things in coffee, like antioxidants. That said, one study specifically pegged caffeine levels in the blood to Alzheimer's disease; subjects over age 65 with the most caffeine in their bloodstream were the least likely to be diagnosed with Alzheimer's or dementia. Even in this study, most of the subjects got their caffeine from coffee, so it still seems possible that the anti-dementia power ascribed to caffeine here could come from some other ingredient in coffee. The well-known Nurse's Health Study, which followed health professionals for 22 to 24 years, found that men and women who consumed more caffeine (mostly from coffee) were less likely to develop skin cancer. Getting enough sleep is important, and you can't completely make up for lost sleep with caffeine. Yet, a jolt of the drug does more than help you stay conscious — sleepy test subjects really perform better on all kinds of tests after they've had it. A military research psychologist remarked that in sleep-deprived subjects, "pretty much anything you measure will improve: reaction time, vigilance, attention, logical reasoning." How does it work? Caffeine blocks the chemical adenosine, whose job it is to make you drowsy. Without adenosine to slow them down, your neurons keep right on firing, and you don't feel like shutting down. Consuming caffeine cuts the risk of suicide by 50%, one study found, probably because the drug "may act as a mild antidepressant by boosting production of certain neurotransmitters in the brain, including serotonin, dopamine, and noradrenaline," according to the Harvard Gazette. 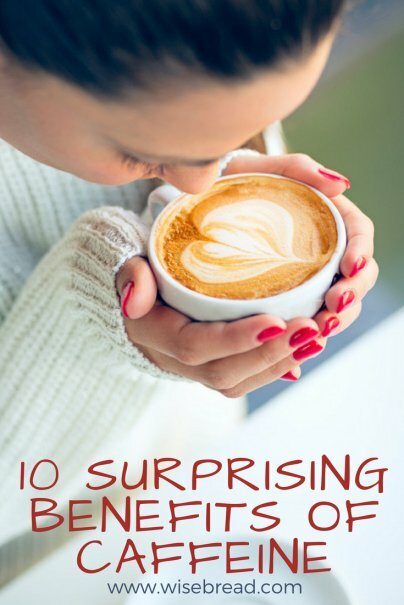 Researchers were able to link this benefit specifically to caffeine, not just to coffee drinking in general. Perhaps counterintuitively, mild caffeine consumption can even help calm anxiety. When asked about the baseball steroids controversy of the 1990s, Joe DiMaggio said that all he had ever used was "half a cup of coffee" from the clubhouse. It may not be banned in baseball, but caffeine has been shown in study after study to boost both endurance and short-term athletic performance. Caffeine is included in a number of over-the-counter analgesics because it enhances and speeds up these drugs' effectiveness. Caffeine can combat common headaches, which are usually caused by constricting blood vessels around the brain. Caffeine dilates those blood vessels, and research shows this effect cures headaches better than ibuprofen. The same dilation effect has landed caffeine a spot in over-the-counter migraine drugs as well. Caffeine in combination with painkillers have been proven to cure hangover symptoms in rats. Caffeine blocks alcohol byproduct acetate. Parkinson's Disease patients have a slightly easier time controlling their movements after taking caffeine pills, one study showed. Theodore Roosevelt is said to have started his "gallon a day" coffee habit to counteract his childhood asthma, and indeed, caffeine has been clinically proven to modestly improve lung function in asthma patients. Like other stimulants, caffeine has been shown to have a positive impact on ADHD symptoms. But hey. When you're trying to eat less and exercise more, ingesting a hot cup of coffee might help you feel satisfied without taking in calories, and if it gives you the energy to hop on your bike and burn calories, all the better. On the other hand, beware of calorie-laden caffeinated drinks like colas, and remember that sleep deprivation causes weight gain. Plants such as the coffee bush use caffeine as a natural insecticide, so it shouldn't come as a shock that researchers in Hawaii found success using a weak caffeine solution to control slugs. But be warned: Too much coffee, tea, or other caffeine-containing liquids can hurt plants, so use with care. Not everyone agrees that caffeine is a net benefit, and there can almost always be too much of a good thing. While most caffeine users report various mental and physical boosts due to the drug, it could be that test subjects might have developed caffeine dependency and need the drug to return to normal abilities. And the Mayo Clinic says that although the association between caffeine and heart disease for the general population has been wiped away by research, the drug can still cause heart problems for some individuals. Pregnant and nursing women are advised to limit their consumption of caffeine as well. Probably the biggest danger associated with overuse of caffeine is sleep disturbance. Research is linking lack of sleep to more and more health problems, from heart disease to weight gain to depression. So if your caffeine use interferes with your ability to get a good night's sleep, the benefits probably aren't worth that one big drawback. What's your favorite thing about caffeine? I don't see how "combats the effects of sleep deprivation" is a surprising benefit of caffeine. It's why everyone drinks coffee in the mornings and refrains from it in the evenings. Love this! There is also the calming effect of having to sip a hot cup of coffee, forcing you to slow down for a bit. That's unless you are just drinking it at your desk while you work! Having a true coffee break away from tasks and especially with others (social benefit) can help you go back to work with renewed focus and vigor. There is the reason that the traditional coffee break is so popular! And if you walk to a coffee shop you get fresh air and exercise as a bonus! I have taken caffeine pills while driving on a road trip. They each have about the same caffeine as one cup of coffee. They work, but with none of the satisfaction of a good cup of coffee! If you can't take all the caffeine in regular coffee, try decaf with also has some caffeine, but in amounts you might be able to tolerate. I use tea as a medicine for my asthma and migraines, mostly for my asthma. IF I have used caffeine, to which I am very sensitive, and it is near the end of the day I use cardamom and make a tea of the spice. Cardamom detoxifies you of caffeine and it works quickly if you have made the tea strong enough. You can get cardamom tea from a health food store, or get Spice Islands ground cardamom and use that. You can make the tea loose, just don't drink the dregs. Better would be to purchase cloth tea bags and put the cardamom in the bag. Sometimes you really need the caffeine, but when you don't it's nice to have something to rescue you from all the stimulation.